Ron and I just got back from a trip to Gatlinburg where we took a week long workshop from Joan M. Morris on shape resist dyeing with natural dyes. We didn’t take photos during the workshop, too busy absorbing it all during the many demonstrations. Besides, Joan didn’t want her photo taken or photos of her samples. It was the kind of workshop I like because it was a technique workshop full of information to put in our tool box of dyeing knowledge. We made a 2 week trip out of this since gasoline is expensive and staying longer didn’t add to the gas bill. I have some wonderful photos to share with you all over the next month or so that we took during the stay. 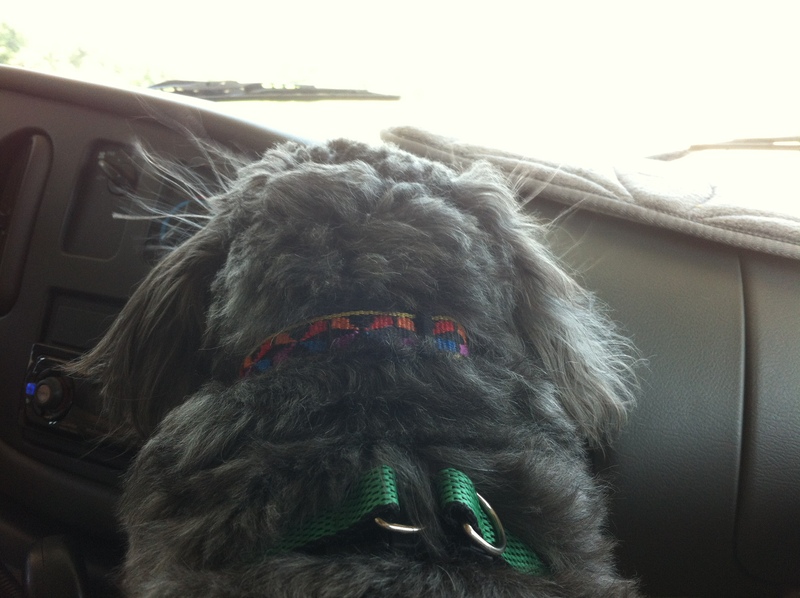 The fur babies travel with us in our small class C motor home. It is really their second home, too, and they all have their chosen ‘seats’ in the cab. Once in a while there is the same kind of bickering between them that most people associate with human kids….you know the kind…..He touched me!…I want to sit by the window!…Its my turn!! !…That’s usually the two boys since LuLu has her spot. She sits right in front of the AC vents with her nose pressed into it and fur flying from the fan. No doubt she thinks she will be healthier with a COLD nose!